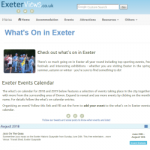 The ExeterViews Event’s Calendar lists some of the events taking place throughout the year in Exeter and the nearby surrounding area of Devon. Please complete this form if you would like to submit an event to feature within the calendar. Complete all the required fields below and then press the ‘submit event’ button. Please try and enter both – a web-link address and a landline contact telephone number to provide visitors with further information if required. Once the form has been received and checked the event will be added to the ExeterViews calendar as soon as possible. However, please ensure that events are submitted well in advance of the event date!